Contestants in NASA's Regolith Excavation Challenge finally struck gold; not in lunar dust, but in prize booty. Team Braundo became the first contender to meet the minimum qualification for the prize. Robot Braundo used a conveyor belt with cup-sized scoops to harvest and deposit over 260 kilograms of material. Lunar soil consists of rock dust particles on average a fifth the size of a grain of sand, but with sharp edges because the moon has no weathering process to grind them down. The Regolith Challenge takes place in a 4-metre-square arena filled half a metre deep with finely ground volcanic rock made as close to real moon dust as possible. Before each machine takes its turn, judges compact the material, rake the surface and randomly place football-sized rocks on top. Most of the would-be lunar bulldozers and dust-diggers were teleoperated from a room just outside the "arena". Just to remind you who landed on the Moon first, NASA added a two-second delay to simulate the time needed to relay signals between the Earth and the Moon. Personally, I think that Jerry Pournelle and Larry Niven are still out in the lead, having used the idea of a telepresence bulldozer in a 1981 novel for just this kind of work. "We were busy," Rachel sat down in the driver's seat and took hold of the controls. "I relieve you..."
Update 29-Oct-2009: Thanks to reader SoggySneaker, I remembered that the excellent 2009 movie Moon has some great scenes involving massive autonomous lunar excavators that are exactly what is prototyped by the engineers depicted in the above video. 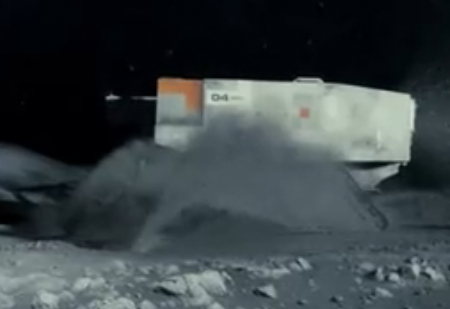 Here's a picture from the movie version of the Moon; take a look at the Moon movie trailer. Read more about the Regolith Excavation Challenge; via New Scientist.